If your familiar with the gameplay attributed to sega's amazing ninja-platformer Shinobi, then this game will take to you very quickly. 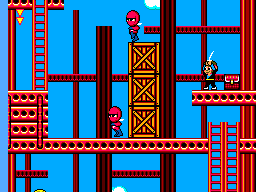 The Shinobi influence is heavy here with swords, powerups, and lots of bad guys. You run through each level until you reach a boss then you beat him. Simple yet fun. Some features include the ability to climb poles and perform a spinning attack which you can control and wipe out enemies in the process. All in all it's pretty basic but very enjoyable. Sega has always shown it's power in it's visuals, and this game is no exception. 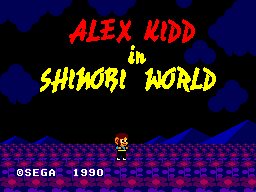 Although a little cartoonie, Alex Kidd in Shinobi world is very nice to look at and is very colourful and vibrant. I like the level design to as the first two really pay homage to the original Shinobi. I liked it, wasn't anything to amazing but reasonable, very reasonable. Yet again you can hear the Shinobi theme often from within the first two levels, and the way they mixed it sounds very good and quite catchy. 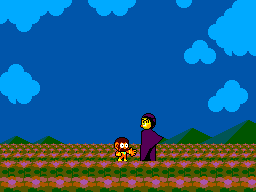 It's a pretty fun game, and honestly it's my personal favourite Alex Kidd game. So if like Shinobi, try this game. And if you don't like Shinbobi, then play it anyways because there is enough differences to make this an entirely different game. I like it, I really like it.